Valves are linear, with bluntly rounded, subcapitate apices. The central area is asymmetric to the apical axis; the central area extends to the valve margin on the secondary side of the valve. Striae are composed of irregularly spaced areolae. The areolae number 20 to 25 in 10 µm. The striae are slightly radiate in the center of the valve, becoming convergent near the ends. The raphe is lateral becoming filiform near the ends. The axial area is linear and bounded by a longitudinal row of areolae on each side. Proximal raphe ends are inflated and weakly deflected to the secondary side. The distal raphe ends are sickle shaped, unilaterally opened to the secondary side. Soninkhishig et al. (2009) observed external proximal raphe ends as unilaterally deflected “croziers”, hooked to the secondary side. Internally, the proximal raphe ends are shown as simple and slightly expanded. 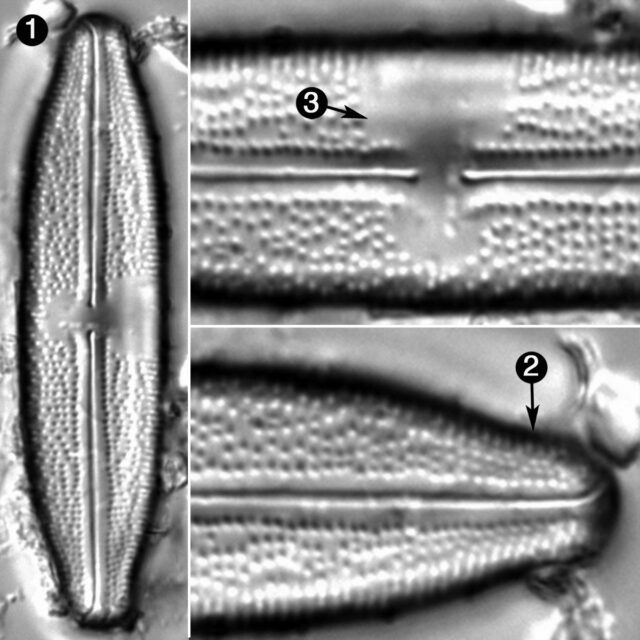 Anomoeoneis fogedii was described from an alkali fen impacted by row-crop agriculture in northwestern Iowa (Reimer 1982). Anomoeoneis fogedii has also been reported from a few calcareous fens in Minnesota (Soninkhishig et al. 2006). Girdle view cell with an internal valves. 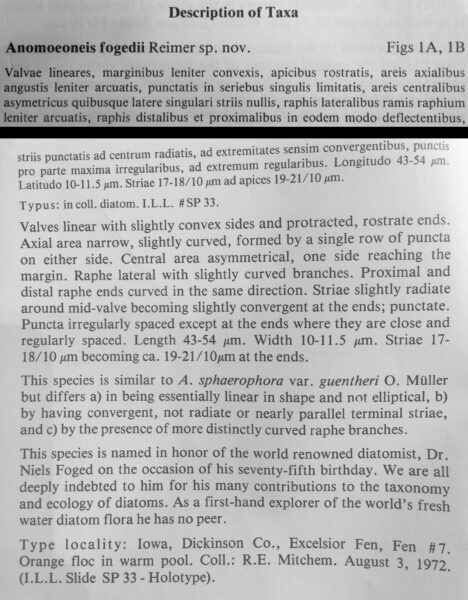 Valvae lineares, marginibus leniter convexis, apicibus rostratis, areis aialibus, angustis leniter arcuatis, punctatis in seriebus singulis limtatis, areis centralibus asymetricus quibusque latere singulari striis nullis, raphis lateralibus ramis raphium leniter arcuatis, raphis distalibus et proximalibus in eodem modo deflectentibus, striis punctatis ad centrum radiatis, ad extremitates sensim convergentibus, punctis pro parte maxima irregularibus, ad extremum regularibus. Longitudo 43-54 µm. Latitudo 10-11.5 µm. Striae 17-18/10 µm ad apices 19-21/10 µm. Valves linear with slightly convex sides and protracted, rostrate ends. Axial are narrow, slightly curved, formed by a single row of punch on either side. Central area asymmetrical, one side reach the margin. Raphe lateral with slightly curved branches. Proximal and distal raphe ends curved in the same direction. Striae slightly radiate around mid-valve becoming slightly convergent at the ends; punctate. Puncta irregularly spaced except at the ends where they are close and regularly spaced. Length 43-54 µm. Width 10-11.5 µm. Striae 17-18/20 µm becoming ca. 19-21 µm at the ends. Type locality: Iowa, Dickinson Co., Excelsior Fen, Fen #7. Orange floc in warm pool. Coll. : R.E. Mitchem. August 3, 1972. (I.L.L. Slide SP 33 - Holotype). Valves are linear, with bluntly rounded, subcapitate apices. The central area expands to the valve margin on the secondary side and is much smaller on the primary side of the valve.